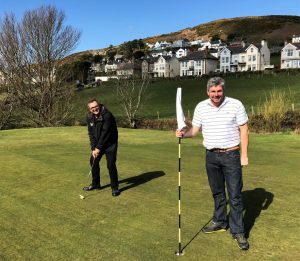 Isle of Man Golf Holidays are looking forward to the 2019 Three Legs Golf Challenge. This well established fun event takes place over three golf courses on the Isle of Man. Open to Ladies, Gentlemen & Mixed Teams. Feeling a little ‘first tee’ on the links? Bushy’s Brewery have produced a Manx bitter for the CAMRA Isle of Man Beer and Cider Festival at the Villa Gaiety commencing Thursday 11th April 2019. Bushy’s owner Martin Brunnschwieler stated, ‘the visiting golfers are generally beer enthusiasts and enjoy our Island. It’s great to see golfers on holiday and enjoying themselves’. 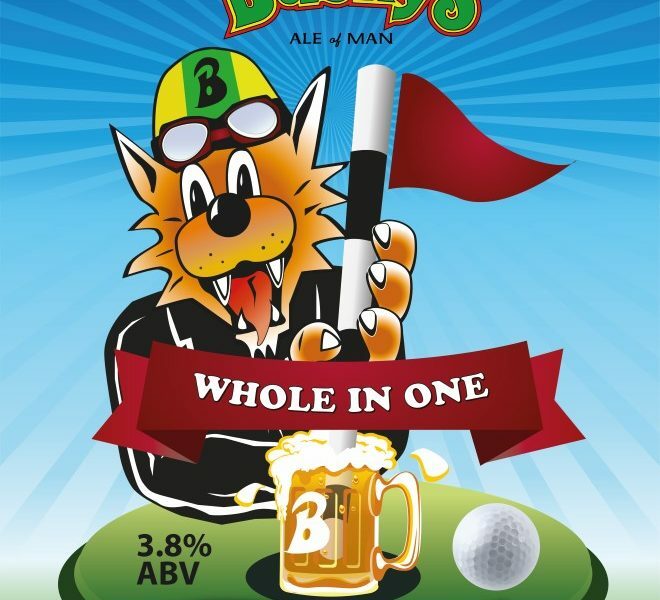 Isle of Man Golf Holidays owner Ged Power remarked ‘ I’m excited that Bushy’s have made a beer for Manx golf called ‘Whole in One’. It’s a celebration of our 8 golf courses and the big friendly welcome that we give to our visitors’. Martin and Ged in action at Rowany Golf Club!